Bend, Oregon, is an outdoor lover’s paradise. The town is nestled between the peaks of the Cascade Mountains and desert plateaus. It was once a small lumber town, but over the years it’s become a central hub for outdoor enthusiasts in the area. There are rivers to paddle or fish, trails to hike or bike, and a vibrant town to explore with a brewery seemingly on every corner. There are also numerous outdoor festivals, multiple tour companies to help guide you through the wilderness, golf courses to enjoy in the spring and summer, and numerous ski resorts to visit when the weather turns cold. In short, no matter the time of year, you’ll have plenty to do and see. 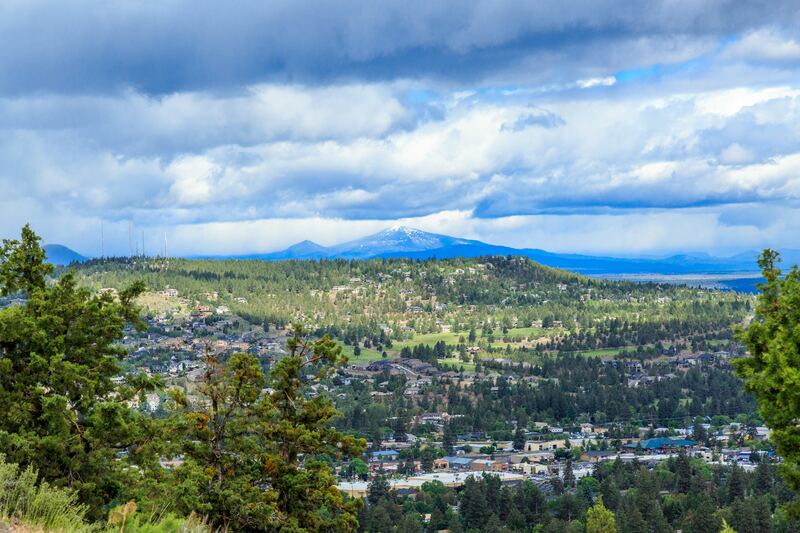 One of the best ways to visit Bend, Oregon, is in your RV. There are numerous RV resorts and parks around the town that you can camp at. The following are five that come highly recommended. Located on the south side of Bend is the Crown Villa RV Resort. It offers over 100 full hook-up campsites and numerous other partial hookup sites. With beautiful views all around, a long list of features and amenities, and the heart of Bend just a quick 10 minute or so drive away, there’s not much to dislike about this RV resort. On-site, there’s a clubhouse, hot tub, steam rooms, fitness center, restroom and shower facilities, wireless internet, cable service, personal storage units, and plenty of activities to partake in when you don’t want to venture out and see what Bend or the beautiful natural landscape has to offer. Another great RV resort on the south side of Bend is the Scandia RV Resort. This family-owned RV resort is just a few minutes drive from downtown Bend and is close enough to local restaurants to walk. The resort has over 60 full hook-up campsites, and it’s important to note that it fills up quickly. If you want to get in, you should make a reservation well in advance. The Scandia RV Resort is a fantastic home base for exploring the area, but it also offers a long list of amenities, including wireless internet, restroom and showering facilities, laundry facilities, outdoor fireplaces, a recreation hall, nearby storage sites, and cable TV. If you’re looking for something a little further out from town, then Bull Bend Campground is an excellent choice. About 45 minutes outside of Bend, Bull Bend Campground lets you truly enjoy the great outdoors. This campground is a popular spot for anglers due to the fact it’s almost completely surrounded by the Deschutes River. The campground is no RV resort. The amenites are few, but if you want to experience the great outdoors and have a comfortable RV, then that should be no problem. The rates are also very affordable, but the campground isn’t huge at just 10 acres. That means you should probably make a reservation if you want to be sure to have a spot. Another option that’s out of town, but a little more luxurious is the Bend/Sisters Garden RV. Located between the towns of Bend and Sisters, the RV resort is just a 24 minute drive from Bend. Near the resort are all kinds of hiking and biking trails, opportunites for horseback riding or watersports activities, and even golf or fly fishing. The resort itself offers over 100 full hook-up campsites and numerous features, including laundry facilites, wireless internet, cable TV, luxury bathhouses, a convinience store, a propane station, fire rings, garbage pickup, meeting areas, and BBQ locations. If you want to be close to all the great outdoor activities, but still enjoy the luxuries of an RV resort, this is a good choice. Do you have any RV resorts or campgrounds you’ve stayed at near Bend, Oregon? Leave a comment below!